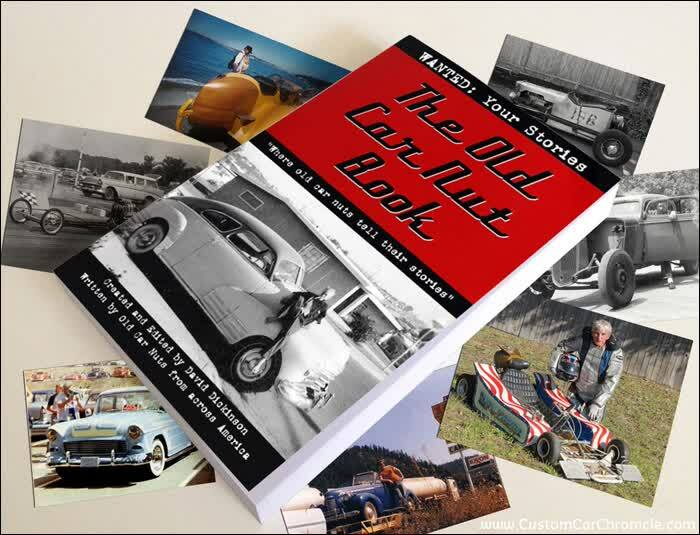 The Old Car Nut Book: "Where old car nuts tell their stories" is an exciting new book project that focuses on the everyday people involved in the old car hobby and their stories from the time that cars first caught their eye to their latest project. Designed with the idea that EVERYONE in the old car hobby has a story or two to tell, The Old Car Nut Book is written by its contributors and compiled by its creator and editor, David Dickinson, a confirmed "old car nut" that loves stories and sharing them. Providing a place for people to tell those stories that often don't get shared outside of a garage or with a couple of buddies from the back fender of a special ride during a car show, The Old Car Nut Book is a unique presentation, not limited to the icons in the hobby that are written "about" in magazines. There are going to be more books and more opportunities to share, so break out the old pictures. Let them tell you the stories, then write them, and pass them on to The Old Car Nut Book. We'll share them with the world. The first book has received much praise and the highly anticipated sequel, book two, is scheduled for release in August 2014. Book three will focus on "Road Trips" and book four will be exclusively "Racing". Those books are being compiled right now, and you can submit your stories and be a part of this fun and entertaining books series. Who doesn't have road trip or racing stories? Visit www.OldCarNutBook.com to find out how to submit your stories. When contacting David with The Old Car Nut, let him know you saw his ad on Northwest Classic Auto Mall. This page has been viewed 11756 times.